All transactions are safe and secure with a reliable history in online purchasing behind each of our associates. Buy the Seinfeld Kramerica Industries t-shirt to own Seinfeld clothing and merchandise. 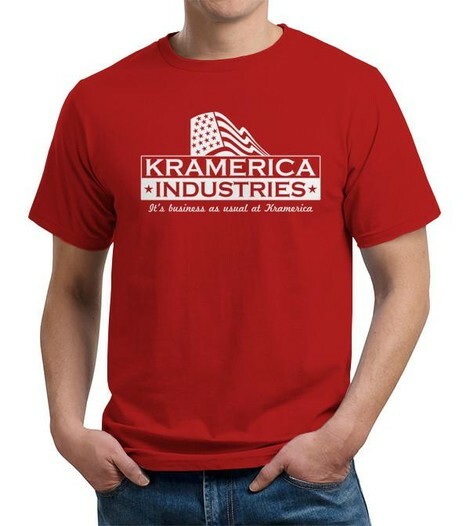 This attractive Seinfeld Kramerica t-shirt displays a logo for Kramerica Industries on the front, along with the tagline, "It's business as usual at Kramerica." Wear it as you recall some of Cosmo Kramer's inventions, including The Bro 'Manssiere' - a bra for chesty men, a coffee-table book about coffee tables, the apartment door screen door, the Make-Your-Own-Pizza parlor, and others. Tell your friends you were an intern at Kramerica Industries. In addition to the Seinfeld Kramerica Industries tee above, browse the Seinfeld Clothing Gallery for more apparel like men's and women's clothes, kids shirts or hoodies.